The potatoes this week are a mix of Carola and All Blue varieties. Imagine the shock when you serve the kids purple mashed potatoes! Fun with food! Your bag of wee onions must be refrigerated. We harvested all of the onions last week and, like garlic, it takes some time for them to cure. The hot pepper options are red jalapenos or various shades of Hungarian hot wax peppers, which are a bit milder than the jalapenos. Remember to be careful when handling the seeds and inner membranes of these peppers…wash your hands thoroughly after preparation, or wear gloves. It can be hard to remember how challenging this season has been, especially considering how hot and humid and summer-y the weather has been these past couple of weeks. For now, we have plenty of taters in the ground, and the cukes and summer squash are still producing like crazy. 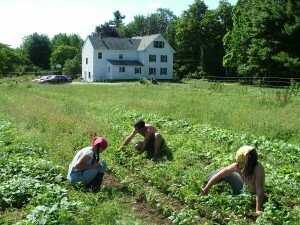 However, we’ve passed the halfway mark for our potato harvesting, and the cukes, etc. won’t produce forever. I’ve mentioned in the last 2 or 3 CSA pick-up posts that we’ve been doing a lot of planting, and that’s true. However, we may be facing a lag very soon as some veggies (or some plantings of certain veggies) stop their summer roll and before our latest plantings get going. So, the next few pick-ups may be on the small side. I know I sound like a broken record here with the doom-and-gloom predictions for smaller shares, but I want to keep saying it so everyone is aware that it may turn out that way. And if the shares keep on being decent-sized, then I’ll very happily be wrong!